I’ll get better at blogging regularly, I promise. I am completely OVER people talking about how busy they are, but MAN I HAVE BEEN BUSY. Since my last post, I had a baby and moved to a different city. It seems so neat and compact in that little sentence, but it has been a frenetic year. In my last post I talked about how bulimia doesn’t just go away when you get pregnant. It has, however, seriously declined (almost to nothing) since I had the baby. I’ve had less than five (I can really only think of 2) instances of an issue, and they were a fraction of what they used to be. I’m out of the weeds (I think), but have been thinking a lot about life– my eating disorder, drinking, etc.– lately. There is still a long way to go (maybe this is just life? sigh). Something I heard recently said you have to write from scars, not open wounds. Maybe that makes sense. If you’re trying to help someone through something, and you’re teetering on destruction yourself, it can be a codependent nightmare. But there is great hope to be gained from words spoken from the battlefield. Someone speaking from a place of THIS IS F-ING HARD. I GET IT. I’M IN IT WITH YOU. The blogs I wrote over the past few years were from the battlefield. Now I feel like it’s a little behind me. And I’m trying to honor that place too. Work through other issues going on in my skull. Be a whole woman, wife and mom. We are a work in progress. We need people to lean on. People around us to verify WE ARE NOT ALONE. It’s so important. My hope is you’ll stay tuned in this new era of she.chose.life. One that is hopefully out of the weeds of an eating disorder, but still in the thick of figuring out life. Let’s figure out this crazy, sane, free, complicated, beautiful, brutal thing called life, together. This past year has been a complete whirlwind. In May of last year, I started seeing someone whom I had dated a few separate times over the past 10 years and that I’ve known since I was 16. He’s a great guy, and while the timing never really worked for us before, it just clicked this time. When you know, you know. After over a year together, we got engaged in May. I’m 33 and spending the rest of my life with someone is not something I’ve taken lightly nor have I wished my life away waiting for the person I’m going to marry. So, it’s even more ironic that he’s someone I’ve known for so long. Seth is a beautiful person. He doesn’t complete me, in that sappy, V-Day card writer lingo, but we complement one another in really sweet ways, and it’s a beautiful new chapter of my life. Within days of getting engaged, we found out we’re having a baby. Holy crap. So. We planned a wedding in less than 2 months and got married at the end of July. Whirl.wind. Eating disorders don’t stop for you to celebrate life and the fun things that happen. You don’t find out you’re pregnant and suddenly stop having the urge to B/P. In fact, when it does happen, you feel like the most horrible person in the world. To everyone reading this that’s struggled with an eating disorder while pregnant (or not) — YOU ARE NOT ALONE. I’ve read through forums for pregnant women and when someone posts about being bulimic and pregnant, you would not believe the haters out there and the harsh language whipped out against the preggo mommies. Call me the opposite of an internet troll, because every part of me wanted to hug these vulnerable women when their posts are met with a “how could you do this to your baby? ?” comment. We need to sit with people. Be with people in their confusion and pain. Life is hard. Glossing over the bad parts doesn’t make them go away. We can’t always fix people, but we can let them know they’re not alone. It’s been a crazy year. But one full of life-giving change. And full of hope. It’s been a hot minute since I’ve posted. It’s also been over 6 months since I’ve had any issues with my bulimia (6 months and a week to be exact). That is a major milestone, and I can’t recall the last time I’ve had such a solid stretch with no issues– hoo-freakin-ray! Let me back up a few months and share a little about the change of my mindset. I spent a lot of time alone over Memorial Day weekend. Which is usually terrible for my B, but on the Saturday of that weekend I took myself paddleboarding on a river near my house and spent over 2 hours in quiet and nothingness. I’m an introvert and am usually good on my own, but I also usually have a computer, tv, phone with which I can distract myself. Two hours of solitude on a river is a bit much, even for me. And while I was out there, I realized that no one can (or will) take care of me the way I can. (You may want to read that again.) YOU are best equipped to take care of YOU. And I started thinking, what if I end up alone for the rest of my life? What sort of shape will my body be in if I’ve tortured it endlessly with bingeing and purging? And to what end? It’s HARD WORK dealing with and processing uncomfortable emotions and situations. But I realized it’s even worse to abuse my body instead of doing that work and standing up for the person I was created to be. It was like I gave myself permission to take care of ME. To not give a damn about what other people thought of me. It feels so small as I type this out, but it was a huge revelation for me and has been a huge part of my healing. So. I haven’t purged since Memorial Day Weekend. It is an understatement to say it hasn’t been easy. But it’s also not been as hard as I thought it would be. I’ve seriously thought about B/P less than ten times. But I’ve been consumed by thoughts of food/calories/weight gain. I’ve gained about 6 lbs. In the big scheme of things, not a big deal, but it certainly seems like one. So I guess I’m still working through my relationship with food and exercise and getting healthy. I’m not recovered by any means (I think once I stop obsessing over what I eat I’ll consider myself further along in recovery), but I have to keep reminding myself that a 6 month stretch of not purging after dealing with this on and off for 16 years is HUGE. It’s a step in the right direction. I’m sharing this in hopes my epiphany on the river can help someone else. Please email me : shechoselife@gmail.com if you ever need someone to talk to who understands what you’re going through. The holidays can be rough. It’s bad enough that I judge myself all the time, being under family scrutiny is even worse. But I know I’m where I’m supposed to be right now. Perfectly imperfect. I’m on a journey of health and freedom, and that is a huge weight off my shoulders. I’m praying that everyone who reads this makes a step forward in their own journey today. I can’t believe it’s been over a year since I’ve started this blog. On one hand, it’s a little depressing. Because I’m not out of the weeds. I thought blogging about my struggle would give me some accountability and would help deter purging. But let’s be honest, the concept of an “accountability partner” for anything in my life has never really worked for me (kudos to those who find them productive). For me, self-motivation is the only way I’m going to get through this. But on the other hand, reading through my posts, I see so much growth over the past year. There have been many purge-free weeks (and a few strung together!). Something that was virtually non-existent prior to working with my counselor. I am starting to get a firmer grasp on what sets off my purging episodes, which is helping me work through those situations in a healthy way rather than running to B. The big one – I HAVE HOPE. I know this isn’t going to be a part of my life forever, which is something I didn’t have the hope to see when I first started this process. I thought purging was so ingrained in my daily habits that I couldn’t escape it. My health and my happiness is my number one priority. At the end of the day, I have to be happy with me and the person I’ve become. It doesn’t matter how much I weigh, how many friends I have, or whether or not people approve of my choices. It just. doesn’t. matter. So. I’m not fully recovered by any means. But I’m a lot further along than I was a year ago, and progress is something to be proud of. It’s something YOU can be proud of. 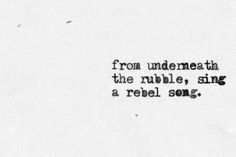 From underneath the rubble, let’s sing the rebel song. Maybe I had my blinders on before, but lately it seems like I’m constantly bombarded with the reminder, “the time will pass anyway.” Usually, it is an inspirational quote designed to encourage gym time or taking up a new hobby or enrolling in a continuing education class, but regardless, the message is the same– life goes on, don’t wait for tomorrow to start something new, begin today. I have a particularly hard time with this. Like many, I am a procrastinator. Why do today what you can do tomorrow. I love a deadline. I love that “crunch time” feeling. My college GPA would suggest that crunch time doesn’t love me, but who am I to argue. Point is, for the last 16 years, I’ve been negotiating with myself about kicking bulimia to the curb. “Just this one last time” … “Tomorrow is a new day” … “Tomorrow will be the first day of the rest of my life” … “Today was just so stressful” It’s amazing how the excuses add up, and how willing I am to let myself slack off. But here I am, so many tomorrows later, and still promising myself that tomorrow will be the first day in a bulimia-free life. But the time will pass anyway. I can’t get this out of my head. For example, it seems like yesterday that I started a new job. It’s been two years. Looking back, I can see how much I’ve learned. I see how far I’ve come in understanding this new (to me) industry. I’m really proud of myself. The time passed anyway and I took advantage of it, making note of how and why we do things. My peers respect my hard work and how I conduct myself. I’m confident in my work product. The time passed anyway, and I made the most of it. Just a quick update here. I am currently on day 6 in a string of good days. To be honest, I’ve been down and out with a cold/flu since Wednesday, but I’ll take a winning streak however I can get it. It’s funny the promises we make to ourselves when we are at our lowest. Lying in bed over the weekend, I promised myself that I would never purge again if I could just get well. And then I realized how I take my good health for granted and abuse the luxury with my reckless B/P episodes– I am grateful to be (almost) 32, full of life, and with family and friends that support my wellness. Over the past year or so, I’ve kept a gratitude journal. Little snippets out of every day for which I am grateful. The funny thing is, I become grateful for even the smallest of things when I am in the habit of staying present and keeping my eyes open to the life around me. The gratitude list goes from the really big things (health, stability, etc.) to the most minute things (dinner with a friend, coffee in the morning, fortunes in the fortune cookies) when I am tuned in to how beautiful life can be. I think this ties in to my recovery in some way. Understanding that each moment is a gift and to not waste my precious, one shot at this life on others’ expectations or stripping away my value because of the way I look. Using each encounter with another human as a chance to see the world through their lens and to grow a little further in my own journey. Perfection will never happen. What does ‘perfect’ even mean? And what a waste if I’ve poured out my real self only to leave behind my false self. Here’s to be grateful for and embracing reality. Happy Monday (I’ve had an ample amount of coffee, so I can officially say that) – I hope everyone had a nice weekend. I live in North Carolina, and the weather is finally picking up on the fact we are in the midst of fall, and it’s been lovely to put on a jacket before stepping out– hope that it stays this way for a while. Up until this point in the blog, I haven’t mentioned my faith. Mainly because it’s an interesting piece of the overall picture that I’m still trying to figure out. But also because I don’t want to alienate anyone. Our paths to healing are all so individual, and I’ve said before there isn’t a one-size fits all path to recovery. But at the end of the day, my faith is a big part of this journey, and I am just trying to air that out on this site with authenticity. Take what you will from this or leave it on the interweb, no judgment or expectation at all. Almost six years ago, I decided to start going to church. My parents raised me with great morals, but going to church was never a huge part of my life and one day I woke up and thought it would be a nice thing for a responsible adult to check out. The story is much longer than the context of this blog post, but on the short– I fell in love with the teachings of Jesus and witnessed and experienced a lot of unexplainable things that removed most of my doubt. I say most, because I think doubt is good and healthy and keeps people searching and on their toes. As I suppose with any faith, the journey (there’s that crazy word again) is interesting and deeply personal. When I first became a Christian, I thought that if I were “X” God would take away my eating disorder. So, I responded in what I saw as the path to sanctification– not drinking, judging others, only hanging out with Christians, volunteering, the list goes on. There are moments when I look back at that time and my stomach flips at how gross of a person I was. My faith eventually (thankfully) morphed into something much more genuine, and about my relationship with God, not what I (or others) did or did not do. But that was even harder to reconcile with my eating disorder. I genuinely loved God. I longed to love and respond to others as Jesus would have. I prayed fervently for healing and it still didn’t go away. It was almost as if God loved every part of me except for my bulimia, and there was a ton of shame and guilt about this ugly piece of my life. So I turned away from Him (not completely, but I took a giant step back) and sought help from a non-Christian counselor. She and I did some ugly, dirty work with somatic therapy– accepting who I am and not doing anything that doesn’t feel right in my body. There were some huge breakthroughs, and in so many ways I am a much calmer person, more comfortable in my soul than I’ve ever been. Faith was rarely a part of our discussions, the focus was on the facts and what my body was telling me to do. 1. I’ve admitted that I am powerless over bulimia– and my life had become unmanageable. 2. I’ve come to believe that a Power greater than myself could restore me to sanity. SheChoseLife on Sing Rebel, Sing!